Pattern: cowl blogged here, mitts just made up out of my head using linen stitch and more or less the same made up pattern I used for the manly mitts. Yarn: handspun BFL singles from Chris at Briar Rose Fibers, blogged here in its final form. I used about 3/4 of the yarn, lets say 180 yds for the pair. Comments: No mods because it's my own pattern. I cast-on 47 stitches and worked in linen stitch pattern for 2 inches. 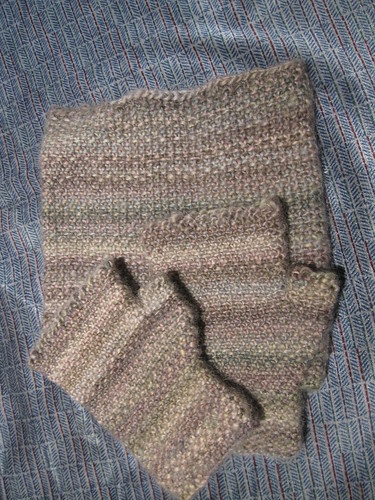 Then I increased one stitch at beginning and end of row (2 sts increased) every third row five times, working new stitches in pattern. worked for about 2 more inches, then put 10 extra stitches on waste yarn, rejoined and worked 2 inches. Bound off in purl. Picked up 10 extra stitches plus 3 more and worked in linen stitch for 0.75 inches around the thumb, then bound off in purl. 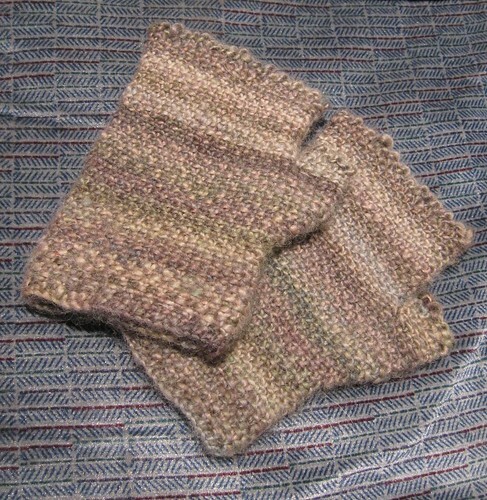 Thankfully my mom's hands aren't too big, because the linen stitch has very little elasticity. But the set was very well received! Written by porpoise On January 6, 2010 In "Christmas 2009", "Ply by Night", "cowl", "designs", "handspun", "handwear"